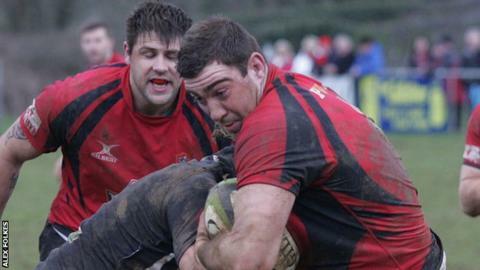 Redruth head coach Adrian Edwards has praised his young players after the narrow defeat at Chinnor on Saturday. The Reds were 20 points behind at half-time and almost stole victory late on before losing by a single point, 35-34. "After being on the bench all year, the young lads really proved themselves," Edwards told BBC Radio Cornwall. "Those guys will be regulars over the next couple of seasons. On reflection we could even have won but to come back from 30-10 down showed great spirit." Redruth closed the deficit to within a score but just could not get over the line in the final 15 minutes of the match. "It was a different game in the second half, we were camped in their 22 and being hyper-critical we should've taken more points," Edwards added. "But still, to have a few players missing and for Dan Job, Neil Turner, Jake Raymond, Murray Westren, Dean Bonds to come in and perform like that was an outstanding effort. "It's the only way they'll improve and with three consecutive home games now we can take a lot of positives into the coming weeks," he concluded.